Superhero Sayings: It's clobberin' time! The Thing is stuck in smalltown America in a mexican standoff between Kree and Skrull warriors and he yells out his signature warcry before laying into both parties. This story predates the Skrull secret invasion but actually seems to fit in quite nicely with what happened during that storyline. 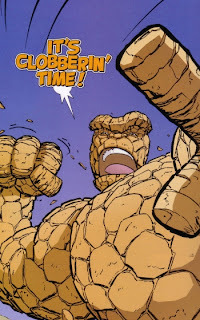 This is a gem of a story if you're a fan of The Thing or underdogs in general as we really get to grips with what makes Benjamin Grimm tick! It's also the first time that Geoff Johns and Scott Kolins work as a creative team before working again on The Flash! This should be in the bargain section so pick it up if you find it for a decent price! If you ask people to list a few quotes from Marvel Comics this one should pop up everytime! The only lesson I can get from his warcry is that when things break down and you have nothing left but to fight then make sure that you don't hold back! Let those who stand in your way know that they're in for a rough time! References: Taken from The Thing: Freakshow (ISBN: 0-7851-1911-6) by Geoff Johns (writer) and Scott Kolins (artist).